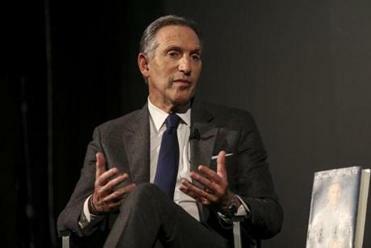 Howard Schultz talked about his book at the Brattle Theater in Cambridge Tuesday night. This whole running for president thing — it’s not going to happen. The high-priced political consultants you hired may be telling you otherwise, but I’ve got a better place for you to sink your millions. And I’m not going to charge you for it. First, it should really go without saying that a candidate who is pro-immigration, pro-gun control, pro-gay rights, and pro-racial equality isn’t going to win over a lot of Republicans. Opposing raising taxes on billionaires, standing against Medicare-for-All, obsessing over the deficit, and suggesting cuts to Social Security and Medicare won’t endear you to Democrats either. That may explain why you’ve got a favorability rating of around 4 percent. Democrats have said an independent candidacy by the former Starbucks chief executive would only help reelect President Trump. I think the Ebola virus scores higher than that. Second, all your tweets are getting ratioed and even Donald Trump is dunking on you. Democrats are apoplectic that you’re going to get the president re-elected by slicing off a little piece of the anti-Trump vote, and there’s some polling that suggests they’re right. Do you really want to be that guy who gave us four more years of Trump? I’m sure you don’t. And I take you at your word that you love your country. After all, while you could just sit back and nap on a giant pile of money, you’re out there talking to people, doing interviews, and getting heckled at Barnes and Noble. So here’s a suggestion that would do far more to help America: Go buy a newspaper. Buy a couple actually. I don’t mean the New York Times or the Boston Globe. They’re not for sale and their owners are among the finest people in the world. Buy some mid-sized newspapers, the kinds operating on shoe-string budgets, staffed by overworked and underpaid reporters, and barely surviving. Hire smart, enterprising editors to run them and give them free rein and lots of cash to ramp up their operations and do great public interest journalism. This kind of financial investment couldn’t be more urgent. It’s only February and more than 2,000 journalists have already lost their jobs this year. You’ve seen the headlines: Buzzfeed, Vice, Huffington Post, McClatchy, Gannett, the Dallas Morning News. It’s been a bloodbath. Two thousand newspapers have closed or merged. Between January 2017 and April 2018, more than a third of the largest newspapers in the country laid off employees. About 1,800 newspapers have closed or merged since 2004, and more than 1,300 communities lack a local paper, in effect, becoming news deserts. This growing dearth of local news is terrible for democracy. Without effective news outlets in smaller cities, who will hold political leaders accountable and keep citizens informed of what’s happening in their communities? You live in Washington state. When the Seattle Post-Intelligencer closed there in 2009, studies show that civic engagement actually decreased. You’ve said that no one wants to see Trump leave the White House more than you. Well, here’s something to think about: he outperformed 2012 Republican nominee Mitt Romney in communities with low newspaper circulation. . . and did worse in places with heavier circulation. Local newspapers are failing, in part because they haven’t figured out the challenge of finding an effective business model that ensures profitability in the digital age. But maybe that’s not the future of journalism. Maybe newspapers are the new Carnegie Libraries — supported by smart, civic-minded, philanthropic Americans with deep pockets. Look at what Jeff Bezos did with the Washington Post. He plunged tens of millions of dollars into the paper and it’s doing some of the best journalism of the Trump era. The Los Angeles Times and the Atlantic are ramping up their operations because of support from billionaire owners. You can be that guy! I’ve heard you say that you’re “living proof” of the American dream and it’s hard to disagree. Your rags-to-riches story is impressive. Now you have a chance to take what you’ve accomplished and use it to strengthen democracy and build stronger and more resilient communities. And I can promise you one thing: If you make newspapers, not the presidency, your focus, you’ll be remembered for a lot more than coffee and cake pops.